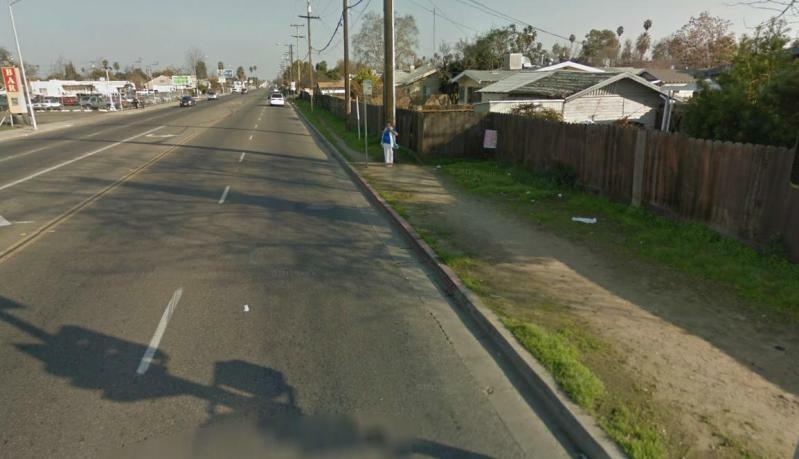 You’d never know it to look at the transportation infrastructure, but many people walk to get around south Fresno. You can tell from the dirt paths they leave behind. Nameless brave souls have cut a passage through the grass next to the town’s wide, high-speed arterials, and behind its Walmart. Recently a public meeting was held in this lower-income central California community, and Network blogger James Sinclair of Stop and Move was in attendance. Despite the myriad pressing social issues in this community, street conditions were the number one concern, according to an open-ended survey of local residents. The people doing the survey expected responses like “more police”, “better education” and “parks”, as south Fresno has more crime, lower performing schools and a lack of green space. But that’s not what people said. Most people said what they would spend money on fixing were the streets. More sidewalks, safer roads, and better looking roads. I can see why improving the streets is of such importance to these residents. Right now, their main system of transportation, their main interaction with city infrastructure is broken. And that kills commerce, it kills recreation, and it kills the creation of a positive sense of community. You can’t revitalize a neighborhood if nobody is willing to give it a chance. No resident wants to stick around and build his home, his business and his future among blight. You don’t need graffiti or broken windows to create blight as cracked or nonexistent sidewalks, barren asphalt landscapes and hostile barriers to walking are essentially government-sanctioned blight. It’s sort of shocking that the safety and mobility of this community have been so completely ignored by transportation planners. But it happens in towns across the country every day. Hopefully, Fresno officials will take residents’ recommendations to heart and get busy making the city more pedestrian-friendly. Elsewhere on the Network today: The Dallas Morning News’ Transportation Blog reports that Rick Perry’s debt-ridden TxDOT is raising eyebrows with the record-breaking salary proposal for its new director. Cyclelicio.us warns that a small Wisconsin town is flirting with the idea of bike ban — in the name of “safety,” of course. And PlanBike says that the crime isn’t that GM produced an ad disparaging cyclists, it’s that the U.S. government has taken such dramatic action to ensure the survival of this ponderous, out-of-touch company.